KANSAS CITY, Kan.– The Kansas City T-Bones announced today that the club made a handful of moves to set the 23 man roster for the 2018 season. Kansas City traded IF Jason Rogersto New Britain in the Atlantic League for a player to be named later. The T-Bones also move Christian Correa via trade to Sussex County in the CAN-AM League for a player to be named later. The club traded RHP Travis Hissong and RHP Kyle Hansento Rockland in the CAN-AM League for two players to be named later. And the final move for Kansas City was to place RHP Jackson Lowery on the disabled list. 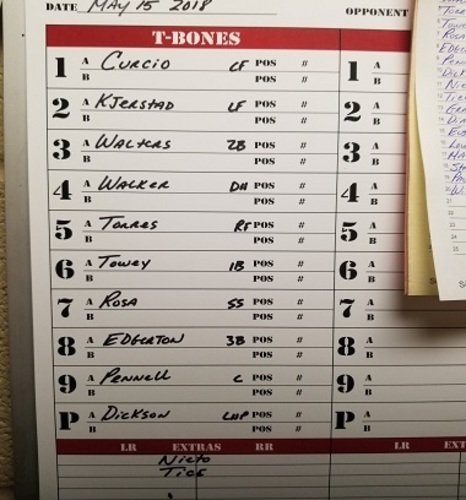 The T-Bones roster stands at 23 with the season opener scheduled for Friday night at 7:05 against the Wichita Wingnuts at Lawrence-Dumont Stadium in Wichita. The T-Bones roster will include three former Big Leaguers: IF Zach Walters, RHP Cody Martin and C Adrian Nieto. One local product returns from the 2014 club, Kansas City native RHP Lucas Irvine. Adam Brett Walker, a former 40-man roster member of the Minnesota Twins, will be joined in the outfield by returning T-Bone Dexter Kjerstad and former Atlanta Braves AA farmhand Keith Curcio. Two AAA veteran-level players will also join the outfield mix in Nick Torres and Cal Towey. The T-Bones will also have rookie and returning catcher Tucker Pennell joining Nieto behind the plate. The infield, led by Walters, will feature returning third baseman Jordan Edgerton along with newcomers Angel Rosa and Dylan Tice. With Martin slated to start the opener Friday night, the pitching staff features AAA-level experience in RHP Hunter Adkins and LHP Cody Dickson. Returning to bolster the pen will be post-season All-Star Cody Winiarski, the right-handed closer. He will be joined by RHP Luis Paula in his second season with the T-Bones and two AA-level experienced pitchers in righty Tommy Collier, who returns to pro ball after a year away with an injury, and Australian right-hander Sam Street. The team will feature two left-handed rookies in Francisco Gracesqui and Carlos Diaz along with right-handed newcomer Pasquale Mazzoccoli and returning T-Bones RHP Jackson Lowery. Julio Eusebio brings low A experience to the roster to round out the pitching staff. The T-Bones (4-1) continue their exhibition play tonight against the Winnipeg Goldeyes at T-Bones Stadium. The two clubs will wrap up exhibition play Wednesday night, May 16th, at 7:05 pm.